I’d like to preface this episode with a little back-story… my oldest daughter was always smart. She was one of those kids who developed skills ahead of other kids her age. She walked early, talked early, counted to 10 and sang her ABCs early… so when she started school and struggled. I was completely dumbfounded. Things got progressively worse through her diagnosis with ADHD – we tried diet changes, therapy, and even medication – but in 1st grade we really hit rock bottom when she was kicked out of a private school that simply did not have to cooperate with her IEP… it’s for this reason that I’m so personally sensitive to how we educate kids labeled with ADHD – and really, any kids struggling in school. We spent so much time in her first school-aged years trying to make her fit the mold, then I heard a quote that went, “When a flower doesn't bloom, you fix the environment in which it grows, not the flower.” And that’s when I realized I was taking the wrong approach. Since that time I’ve adjusted my parenting and expectations. I’ve discovered methods of learning that my daughter thrives with, and I credit her business launch as providing not only a source of pride and accomplishment, but hands-on experiences that really make learning fun and memorable for her. So, when I met Nicole Connell, I knew she needed to join me to discuss the correlation between ADHD and entrepreneurship. Nicole is an Educator and Mentor in the Bay Area. Although she is a certified Educational Therapist, she prefers the title “personal learning fairy godmother.” She loves supporting children to stay connected to their inner knowing and big ideas. She helps parents see the brilliance in their children even if they don't fit into the box and advocates for perspective and paradigm shifts in the educational realm. Nicole confirms that my situation is not unique. She's been working in the educational system for over 6 years and sees the trend of trying to fix the child as opposed to trying to fix the environment. As a student, Nicole was “Miss 4.0.” She was the “golden child” with the ideal school-type brain and she was an easy student to teach and believes that she had a privilege in that regard. In college, she had a pretty massive breakdown because she was not prepared for the “real world” which made her question what she had been taught. She found her way back into education and began her career as a teacher's assistant in a Montessori school. She began to notice and identify the different types of learners, and then when Nicole had her own Kindergarten class she began to identify that many of the behavioral concerns were tied to problems with communication that lead them to act out. 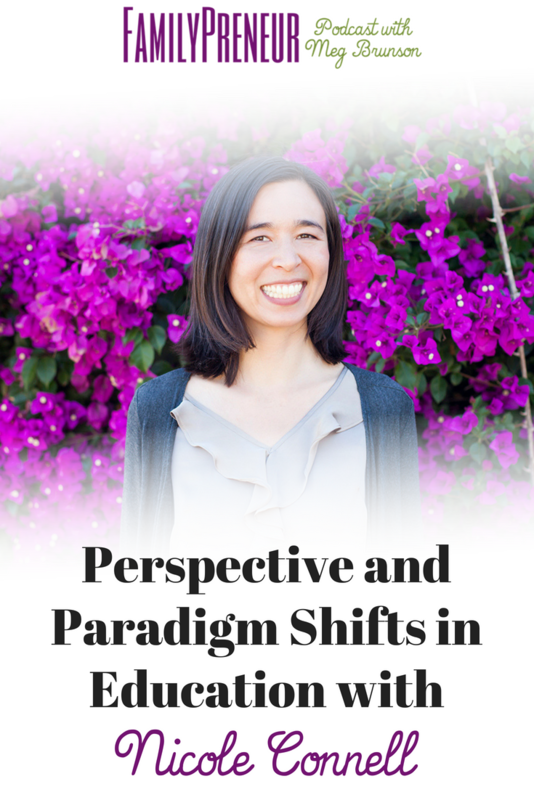 Because she wanted to influence as much change as possible, she shifted her career focus to educational therapy – a niche field that helps kids 1:1. Now she works privately with parents and students. Right now she is working very heavily with kids who have dyslexia. Nicole really wants to encourage a mindset shift. If you have a child who's gifts are not in alignment with the school system, it does not mean that there is anything wrong with the child… it's just a mis-fit. The American education system has a lot of problems, so shifting that perspective is the best piece of advice – and also to listen to your child over listening to the testing. We discuss the disconnect between adults who were good students in school and how they have difficulty teaching children who learn differently because they never had to think outside of the box. Nicole also discusses age segregation… so in her experience with Montessori, the classroom has a mix of ages in the classroom, which allows the older students to help teach and mentor the younger kids. Nicole believes that multi-age classrooms could help with the disconnect. Nicole's philosophy is to support the tricky and nurture the amazing – mainly just creating space for the child, and following their interests. So, whatever they are into, and whatever they love – empower them to follow those passions! Right now, the biggest lessons Nicole is learning is centered around how we view diagnosis and how we treat children. A student recently told her that she thinks that the purpose of testing and diagnosing is to fuel the parent's egos – so the biggest learning that Nicole is in now is a process of questioning how we diagnose and label our children. Nicole reflects on that quote and it resonated with her because it hits on the misalignment with the traits that we value in school – sitting still, following boring directions – but, school is very different from the real world. And these kids don't fit in well in the school environment, but those traits are actually make them prone to success in entrepreneurship, artistry, creativity, etc. The traits that school wants are very different from what the real world wants. And the danger of our school system valuing those traits is that the kids who get those labels, go through school thinking that there is something wrong with them and that they are flawed, but really they are just gifts that are untapped and unable to be met in the school system. Mariana is a Certified Business Coach + Consultant and international best selling author, she helps seasoned coaches and consultants scale their business by creating and launching their 6-figure group coaching programs. She uses her background in brain science, hospital administration and 12 years of marketing, sales and business experience to get results for your clients at scale, market in a way that attracts your ideal clients and convert followers to clients through service-based selling. She has been featured in various podcasts, blogs and online courses including the Huffington Post, Today.com, and The Millionaire Insider Extravaganza. Through working with hundreds of business, she has empowered them to increase their profit and serve more people all over the world. Marina Darlow is a systems' expert, and a productivity geek. She sees her job as helping impact-driven entrepreneurs get 10-20 more productive hours a week, stop leaking money, and prevent stress-fuel breakdowns. An engineer by training, Marina came to a realization a couple years ago: working for a conglomerate is not as inspiring as she wants her life work to be. The quest for inspiration brought her to found Vision Framework, a company that builds small, purpose-driven businesses from the inside, helping entrepreneurs run their companies with ease by putting effective, easy-to-use, and fun (yep!) systems in place.